Last week, Sony Pictures announced that their controversial comedy The Interview has earned $15 million from online sales and rentals, and an additional $2.8 million in its limited theatrical release over its first five days. The studio released even more sales figures today, revealing that the Seth Rogen/James Franco comedy has earned $31 million in online and VOD sales and rentals, between December 24 and January 4, and $5 million in theaters in that same time frame. The $36 million total is just under half of $75 million Sony spent to produce and market the comedy. The studio announced that The Interview, "is Sony Pictures' #1 online film of all time," with over 4.3 million online transactions in the first week and a half in release. 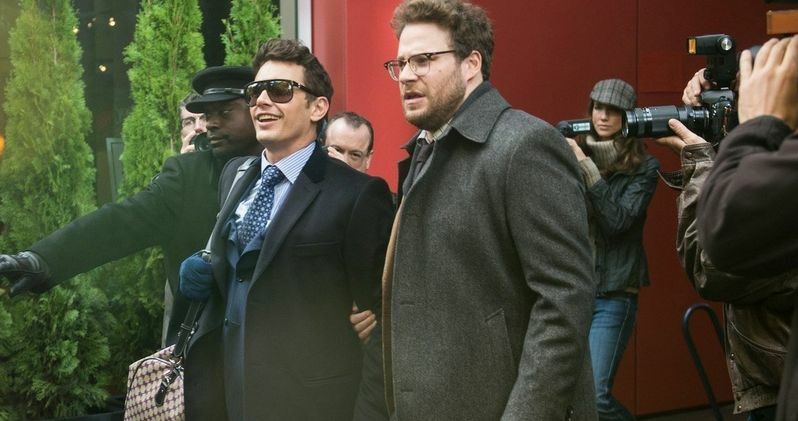 The comedy, which follows a TV journalist (James Franco) and his producer (Seth Rogen) tasked with assassinating North Korean leader Kim Jong-Un (Randall Park), was initially slated to be released in over 3,000 theaters on Christmas Day, before the studio canceled the theatrical release after the hacker group Guardians of Peace threatened a 9/11 style attack on movie theaters. The studio eventually reversed their decision, releasing the film in 331 theaters on Christmas Day and on VOD formats, which was later expanded to PlayStation, VUDU and cable VOD. The Interview also expanded into 580 independent theaters last weekend, nearly 250 more than the initial roll out. Sony hasn't announced if the comedy will expand into even more theaters throughout the month of January. The online/VOD success of The Interview trumps previous hits such as Snowpiercer ($8.2 million), Bachelorette ($8.2 million), Arbitrage ($14 million) and Margin Call ($8 million). However, despite the financial success, The Interview has also landed on the short list for the annual Razzie Awards, with the comedy listed as a finalist in categories such as "Worst Picture" and "Worst On-Screen Duo" (Seth Rogen/James Franco).